We’d love your help. Let us know what’s wrong with this preview of The Case for Gold by Ron Paul. To ask other readers questions about The Case for Gold, please sign up. This thoughtful, well-researched examination of America's monetary predicament has only become more relevant in the 31 years since it was first published. The book originally appeared in the Congressional Record as the minority report of the Gold Commission formed by the U.S. Congress at the prompting of Ronald Reagan shortly after he became president. The majority of the commission did not see a role for gold in the American monetary system, but Representative Ron Paul did. Along with coauthor L This thoughtful, well-researched examination of America's monetary predicament has only become more relevant in the 31 years since it was first published. The book originally appeared in the Congressional Record as the minority report of the Gold Commission formed by the U.S. Congress at the prompting of Ronald Reagan shortly after he became president. The majority of the commission did not see a role for gold in the American monetary system, but Representative Ron Paul did. Along with coauthor Lewis Lehrman, his opinion, upon surveying the history of U.S. money and banking, was and is that the only path to the creation of a prosperous, just, and decent society in the United States would be to restore gold and silver to their original place as the foundation of the monetary system. At the time the Constitution was drafted, everyone had had recent personal experience of the debasement and collapse of a paper currency--in that case, the Continental dollar. As a currency collapses through ever-greater printing of it by the monetary authority, inflation gives way to hyperinflation, with widespread panic, suffering, and injustice. If this provision for gold and silver coin had not been put in the Constitution, many of the states would not have signed off on it. But the issue of how money is managed by a political authority is a complex one, with many players kicking the football. Most of this book, 125 pages, is taken up with the history of money and banking in the United States, and an interesting and little-known history it is. The authors show how the image of banks as bastions of sober, sound managers of money and risk is mostly contradicted by history (not to mention the more recent history of titanic bank bailouts). The history of banking has been largely a history of recklessness, bank runs, and busts, with depositors footing the bill. The fundamental reason for this is the practice known as fractional-reserve banking: the ability of a bank to lend out more money than it has in its vaults. This is made possible by the substitution of metal currency by paper. Instead of carrying around gold and silver coins, the depositor could carry around more portable paper notes instead--notes that he could present to his bank to redeem for gold or silver whenever he wanted. Very convenient. And the bank, which makes its living by lending money, can now lend more of it than it actually possesses. It just needs to keep enough gold and silver on hand to satisfy those depositors who present their notes for coin. And as long as things are going well and everyone's calm, that is not very many. So the profits of a bank can accordingly be very large compared to its "reserve" of deposits. The problems occur when things are not going well and everyone is not calm. As soon as people suspect that they might not be able to redeem their notes for gold, they rush to the bank to do so, and when a number of people do this at the same time, there is a bank run, and the bank often will collapse as a result. And because of the interrelationship of banks, lending to each other and honoring each other's notes, the collapse of one bank usually meant the collapse of more. In the process, depositors' savings would be wiped out. The history of banking is largely a history of efforts to prevent these recurring disasters, while hanging on to the oh-so-profitable practice of fractional-reserve banking that is their cause. One of the main wheezes in this effort was the creation of a "central" bank: a government-backed or government-associated entity that would guarantee the banking system as a whole by providing emergency funding in the event of bank runs. The United States has experimented with a few of these, culminating in the Federal Reserve system, launched in 1913 and still operating today. But as the bank runs of the Great Depression showed, banking panics had not been altogether eliminated. As one of his first acts upon taking office as president in 1933, Franklin Roosevelt, trying to clean up the banking mess, made it a criminal offense for Americans to own gold, and ordered them all to surrender their private gold. He also devalued the dollar from 25.8 grains of gold to 15.25 grains. Apart from domestic ructions in banking, another problem has been international flows of gold and silver. For in the course of trade American dollars have made their way abroad, and foreign countries holding these dollars, if they suspected that the dollar has been overproduced relative to the underlying supply of gold, have turned in the dollars in exchange for the gold. In the 1960s, with the massive printing of money to finance the Vietnam War and Lyndon Johnson's Great Society welfare programs, other countries were doing exactly this at an accelerating rate. For although Americans could no longer redeem their dollars for gold, foreign governments could, and did. The outflow was so great that in 1971 President Richard Nixon, alarmed at the hemorrhage, finally closed the "gold window", and suspended all redemption of dollars. The final link between the dollar and gold was severed, and the dollar has floated without backing of any kind ever since. Paul and Lehrman ably narrate the twists and turns in this story. Then they turn to describing how the United States might be returned to a gold standard. It would require several legislative steps over a period of years, such as repealing the "legal tender" legislation that obliges Americans to accept paper dollars in payment of debts. The authors contend that such legislation is unconstitutional in the first place. Why should we care? For one thing, the authors assert that much of the unpleasantness of contemporary economic life would be eliminated or greatly reduced, for booms, busts, and bubbles are all products of inflation--the practice of promiscuously printing ever more paper money. Beyond that, a proper gold standard forces discipline on governments, who can no longer spend beyond their means, and it also allows businesses and citizens to plan more rationally for longer periods, while also encouraging thrift: the saving of some of our earnings, so that the true wealth of society can grow. I was surprised to discover that this book was a Congressional "report." For unlike most reports, it is passionate, well researched, well argued, and well written. The biggest obstacle to restoring a gold standard is probably that people regard the topic as dull and technical. We're not interested in monetary theory; we just like money and we want it to work. Unfortunately, this attitude has been a costly one, not just in vague social terms but in a reduced standard of living for each one of us, unless we happen to be members of those elites who actually profit from monetary inflation. The Case for Gold completely obliterates the legitimacy and functionality of fractional reserve banking citing devastating historical evidence supplemented by the numerous boom and bust cycles induced by inflation while providing an overwhelming argument for the gold standard. All forms of fractional reserve banking, whether the Federal Reserve, the Bank of the United States or the Post Civil War quasi-centralized banking system, are inherently inflationary systems that wouldn’t have occurred und The Case for Gold completely obliterates the legitimacy and functionality of fractional reserve banking citing devastating historical evidence supplemented by the numerous boom and bust cycles induced by inflation while providing an overwhelming argument for the gold standard. All forms of fractional reserve banking, whether the Federal Reserve, the Bank of the United States or the Post Civil War quasi-centralized banking system, are inherently inflationary systems that wouldn’t have occurred under free market banking. The government’s imposition of central banks is the sole reason for all recessions and depressions. Not only was private coinage in America successful by Christopher Bechtler from 1830 to 1849, but free market banking was successful in Scotland providing a stable banking system with no panics from 1714 to 1844 where there was no central bank, no legal tender laws, no banking regulations, no monetary policy and no restrictions into anyone forming a bank or issuing notes. The gold standard would re-establish economic stability, which would bring low interest rates, increased savings, full employment, real price stability and increased purchasing power along with instituting small government with low taxes and less regulations. The transition to gold would beneficially reform the real estate, agriculture, manufacturing, exporting and small business industries. The content and format of this book reminded me a lot of G. Edward Griffen's book The Creature from Jekyll Island which I recently rated 5 stars for the truths it revealed and its perspective. Ron Paul's book was actually written 11 years earlier and contains a lot of similarities or should I say Griffin's book is similar to Ron Paul's. No one is more of an authority on political and monetary freedom than Ron Paul. This book examines the US dollar's evolution from a precisely defined weight of p The content and format of this book reminded me a lot of G. Edward Griffen's book The Creature from Jekyll Island which I recently rated 5 stars for the truths it revealed and its perspective. Ron Paul's book was actually written 11 years earlier and contains a lot of similarities or should I say Griffin's book is similar to Ron Paul's. No one is more of an authority on political and monetary freedom than Ron Paul. This book examines the US dollar's evolution from a precisely defined weight of precious metal (as authorized by the constitution) to a piece of paper issued by a central banking monopoly with no definition, intrinsic value or constitutional authority. While I find it very hard to refute any of his arguments, I do wonder how he reconciles this philosophy with the unprecidented economic growth and prosperity (real or otherwise) of the Reagan, Bush 41 and Clinton years. Since this book was written in 1982ish, the answer isn't revealed here. I can only conclude that today (2011) he would argue that it was ephemeral mirage whose gloomy fate we were destined to experience as a matter of course. A bit of a difficult read but only at first. Some of the early history of the USAs banking system was a bit heady but it got much more interesting and easy as it went on. More importantly I came away from reading this with a profoundly deep understanding of central banking, the gold standard and our current fiat currency. Paul outlines the good, the bad and the ugly about our current system (mostly bad and ugly) and the same with what a gold standard would do. After reading I know that we Amazing. After reading I know that we will go to a gold standard - it is only a matter of time. It will either be due to our dollar failing and needing to quickly go to a system with some sort of commodity backing, or we do it now and save what is left of our dollar. The founding fathers knew that central banking and control of the money supply was the number one way to control a country and therefore their primary concern. What the Federal Reserve is doing is actually anti-constitutional - that is, it actually outlines in the constitution that the Federal government CANNOT coin money. Coining money is a power reserved for the States. This is not the sort of thing that would appeal to the masses as few are interested in monetary theory, economics, banking, and history. However, if the common man understood the benefits of having sound and honest money, rather than the fiat currencies used by Governments around the world at present, there would be an enormous outcry from Joe Citizen for restoring gold and silver as money, and we'd see much greater prosperity at all levels of society, and much less government hijinks. To anyone This is not the sort of thing that would appeal to the masses as few are interested in monetary theory, economics, banking, and history. However, if the common man understood the benefits of having sound and honest money, rather than the fiat currencies used by Governments around the world at present, there would be an enormous outcry from Joe Citizen for restoring gold and silver as money, and we'd see much greater prosperity at all levels of society, and much less government hijinks. The version of this book which I read was actually the 2nd edition, and I don’t know why the co author Louis Lehrmann was not mentioned on the cover or the interior pages, but this is an amazing book which has further cemented my faith in sound money. Obviously, some of the projections into 1992 were a little off, but the present economic circumstances tell us that Dr. Paul will be right, as usual. The whole thing is only 200 pages even ( plus charts ) but the print is small, and it is printed on The version of this book which I read was actually the 2nd edition, and I don’t know why the co author Louis Lehrmann was not mentioned on the cover or the interior pages, but this is an amazing book which has further cemented my faith in sound money. Obviously, some of the projections into 1992 were a little off, but the present economic circumstances tell us that Dr. Paul will be right, as usual. Finishing this for a second time, I have to say I am a little less impressed with the analysis than before. Not to deny that there are dangers inherent in fiat currency; but many people who argue against it make such doomy forecasts, it's difficult to take them as seriously as their objective. It would be excellent if our government fucntioned within its means. There's no excuse for the wealth redistribution possible by centralized banking; nor is there an excuse for the foreign adventurism that Finishing this for a second time, I have to say I am a little less impressed with the analysis than before. Not to deny that there are dangers inherent in fiat currency; but many people who argue against it make such doomy forecasts, it's difficult to take them as seriously as their objective. It would be excellent if our government fucntioned within its means. There's no excuse for the wealth redistribution possible by centralized banking; nor is there an excuse for the foreign adventurism that rests upon fiat currency. U.S. Representative Ron Paul is a smart guy! In the area of sound money, he is someone you should listen to and learn from. Rep. Paul explains why we should have complete monetary freedom that is not regulated by government, but by the the market (the some of all our individual choices). He is for the freedom of each of us to make contracts with any form of money we choose. Legal tender laws are nothing more than the government using compulsion to force us to use counterfeit money printed out of U.S. Representative Ron Paul is a smart guy! In the area of sound money, he is someone you should listen to and learn from. Rep. Paul explains why we should have complete monetary freedom that is not regulated by government, but by the the market (the some of all our individual choices). He is for the freedom of each of us to make contracts with any form of money we choose. Legal tender laws are nothing more than the government using compulsion to force us to use counterfeit money printed out of thin air by the thugs in the Federal Reserve. Great history of the American banking and monetary system. Really makes you think regarding what really is legal tender? This is actually prophetic in many ways as it describes the devaluation of money because of inflation and debt, sounds a lot like 2008 United States to me. 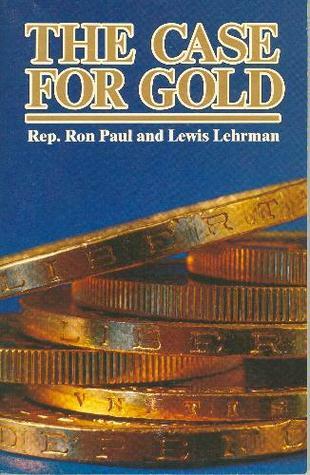 Ron Paul gives an interesting history on the gold standard and why he believes it is needed. Gives good food for thought and is definately quite apt for our time.. Mr. Bernanke take heed! This book was very informative, but somewhat dry. The history of money and banking in the US makes it worth the read.